Time for me to start my build log for the 2018 Modding Competition. A huge shoutout to all the modding community, the group of judges, the sponsors and Dazmode for hosting the competition. Like many of the last year competitors, back in January, I was already thinking about what I could build for this year's competition to blow the judge's minds. I went through a ton of concepts from January to July, and now I'm ready to start the project. I will reveal later on some of the concepts I had and that didn't make the cut to the final build. 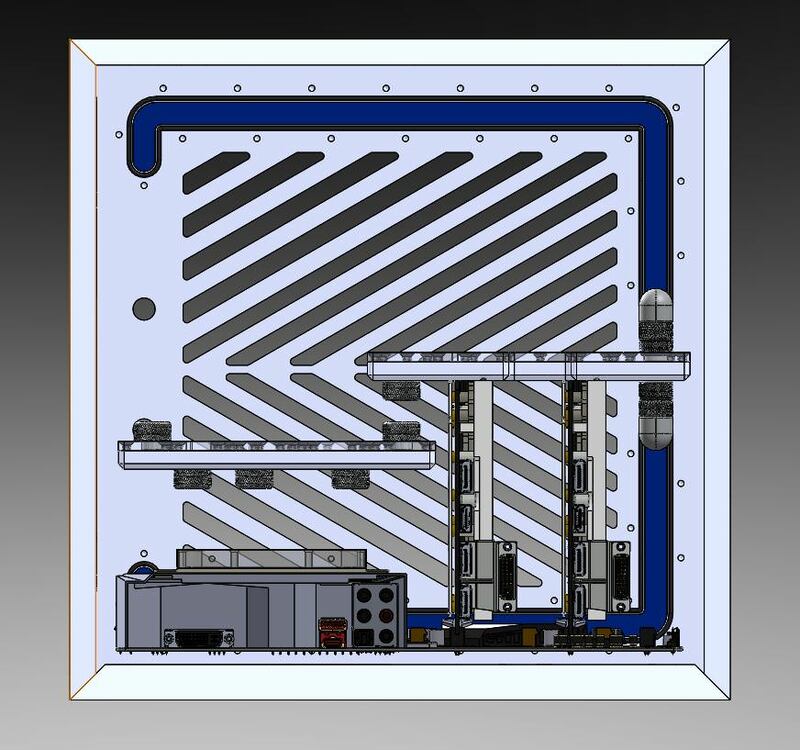 Early 2018, my first desire was an acrylic distribution plate. 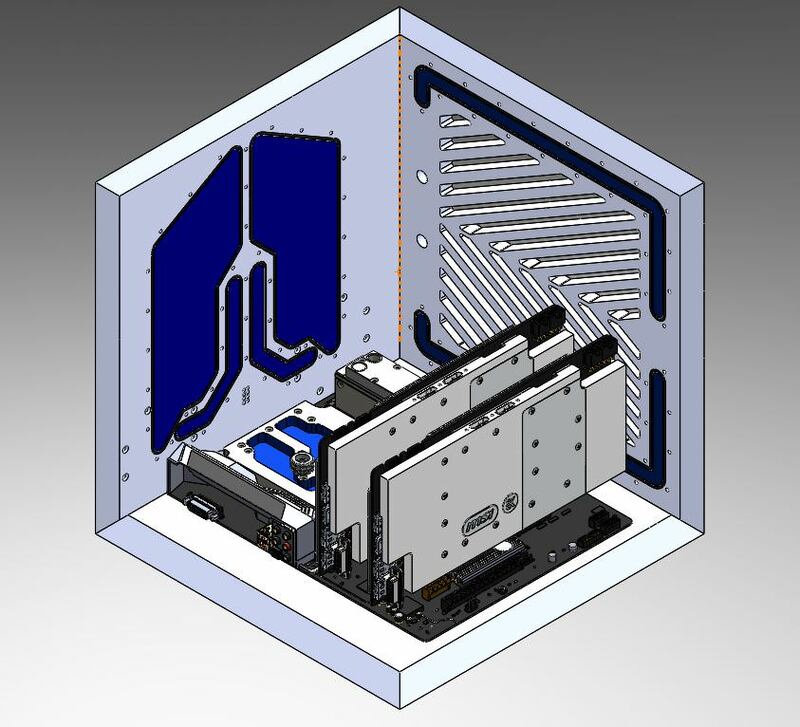 I saw some godly projects here and there on the web with some custom machined acrylic distribution plate. 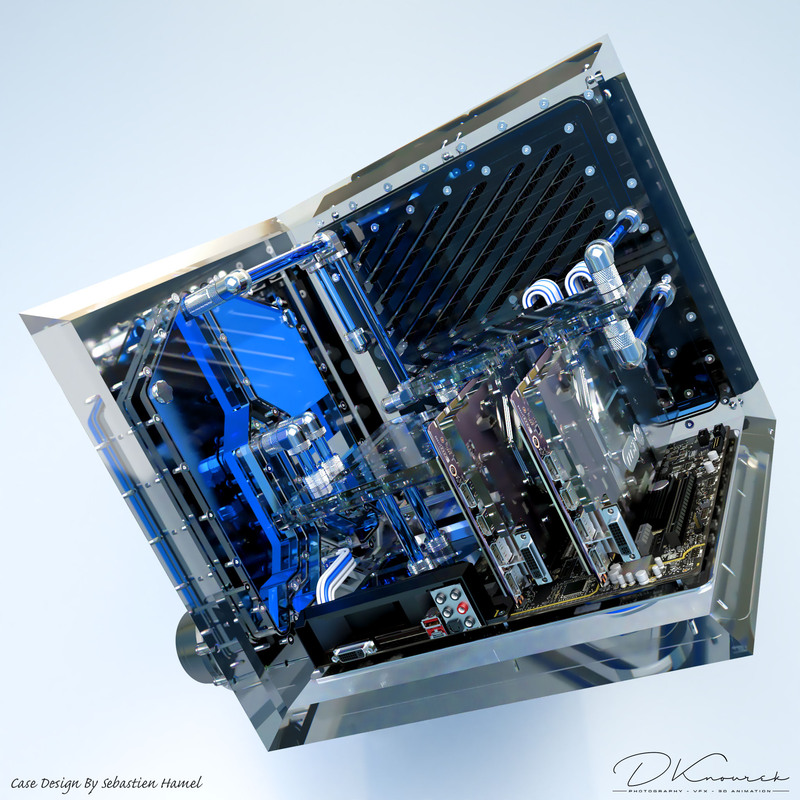 It gives a neat and unique look to a standard case and watercooling loop. So I tried to figure a way to incorporate one (or many) into my build. I wanted to think out-of-the-box. Putting everything inside a rectangular factory made box, I made it last year. I pushed it far, I could have done better for sure, but the box wouldn't be enough this time for my creativity and imagination. Going balls to the wall with a factory made case wasn't enough. So custom case it is. And third, I wanted a design flow. Something I would start with and keep my imagination around it. It was actually the most difficult part of the conception. It doesn't come even if you want it really bad, so you have to be patient and wait for it. It happened mid-June, I was staring at my Solidworks model for the past 10 minutes, resolving my Rubik's cube... and bam. I'm holding it, my design. 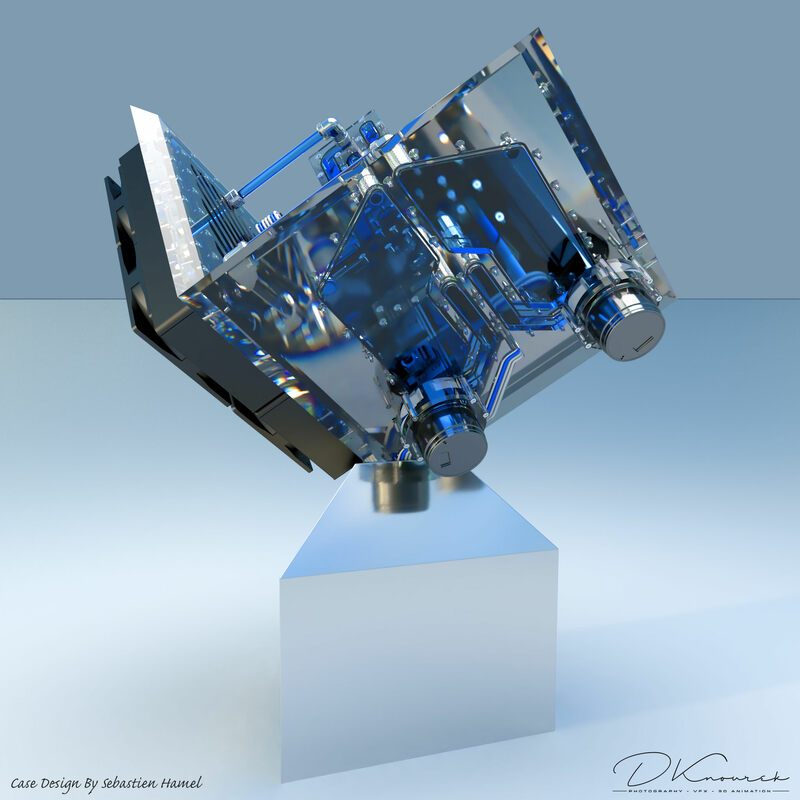 It's going to be a Rubik's cube mounted on its stand. 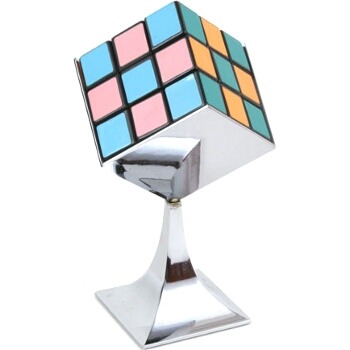 Not the color-wise idea of the cube, but the shape and orientation. 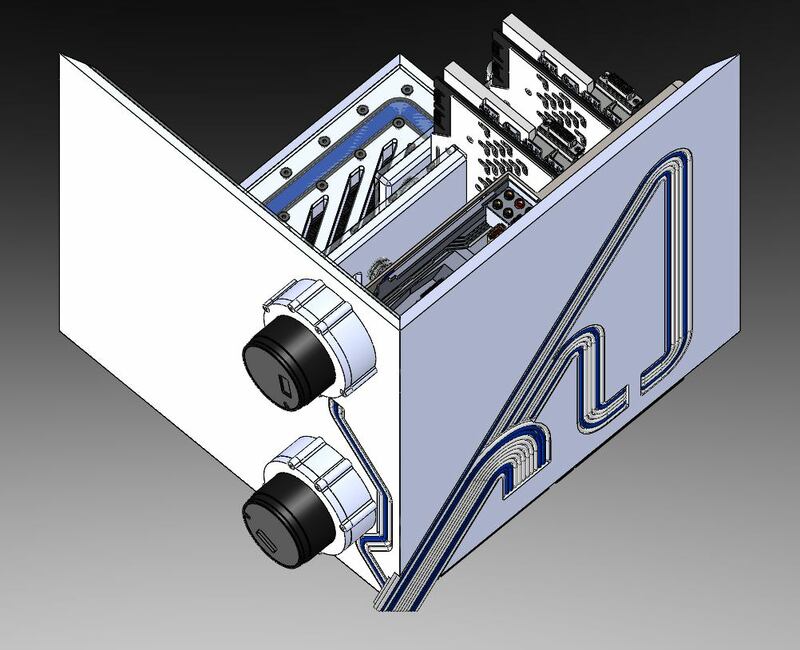 So I was ready to model the case and the components inside the case. 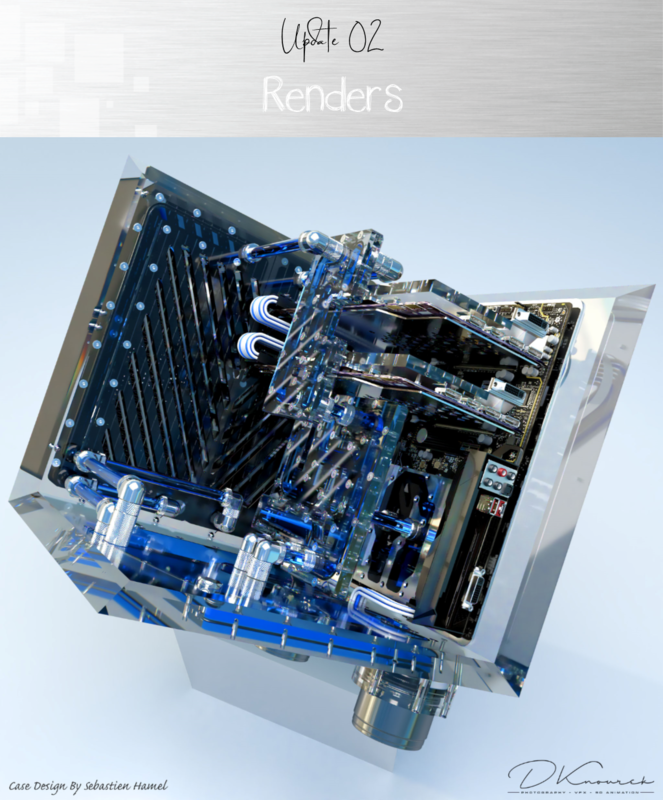 Stay tuned for some renders later this week. It's time to tear down the Skyline build of last year's competition and take some accurate measurements. The margin of error is very slim, so everything needs to be precisely measured and re-measured before machining. The countdown is started, let's do this! Last edited by Seboo; 09-13-2018, 03:42 AM. Some serious machining his time around. Interesting concept. Saw your entry from last year and damn it was nice! Looking forward to seeing what kind of magic you've got up your sleeves this year! Good luck and mod on! 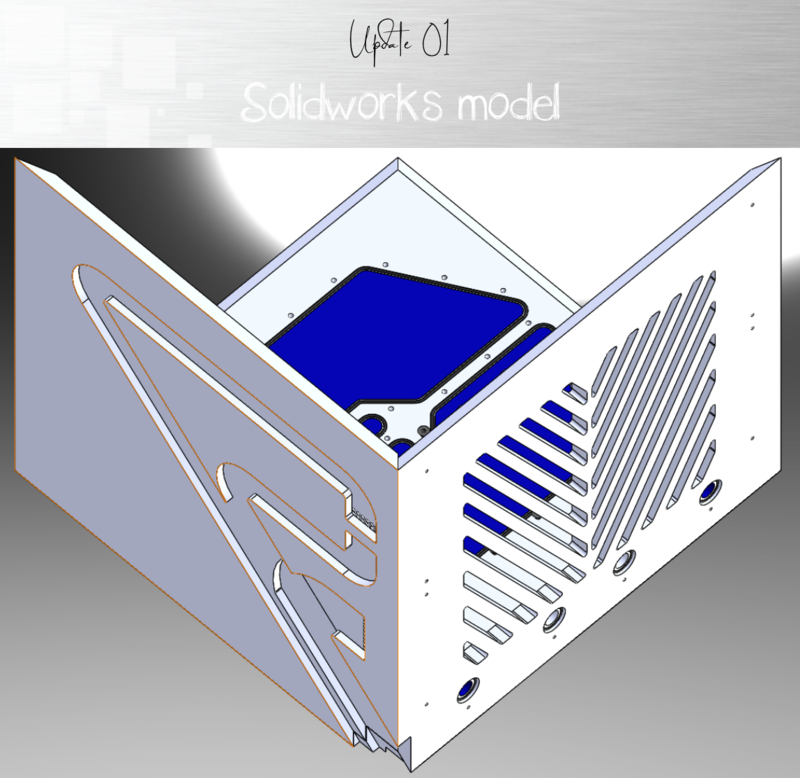 Here's some screenshots of my work on Solidworks, in preparation for the machining. 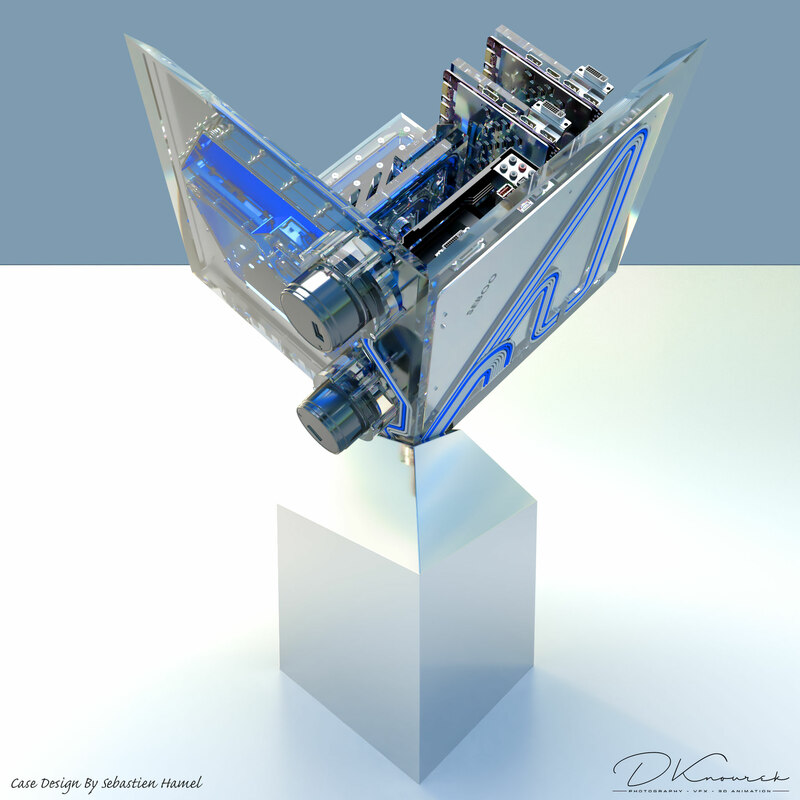 I would have liked to get some renders on Keyshot, but I'm not experienced enough to give a nice render of clear acrylic with liquid flowing through it. 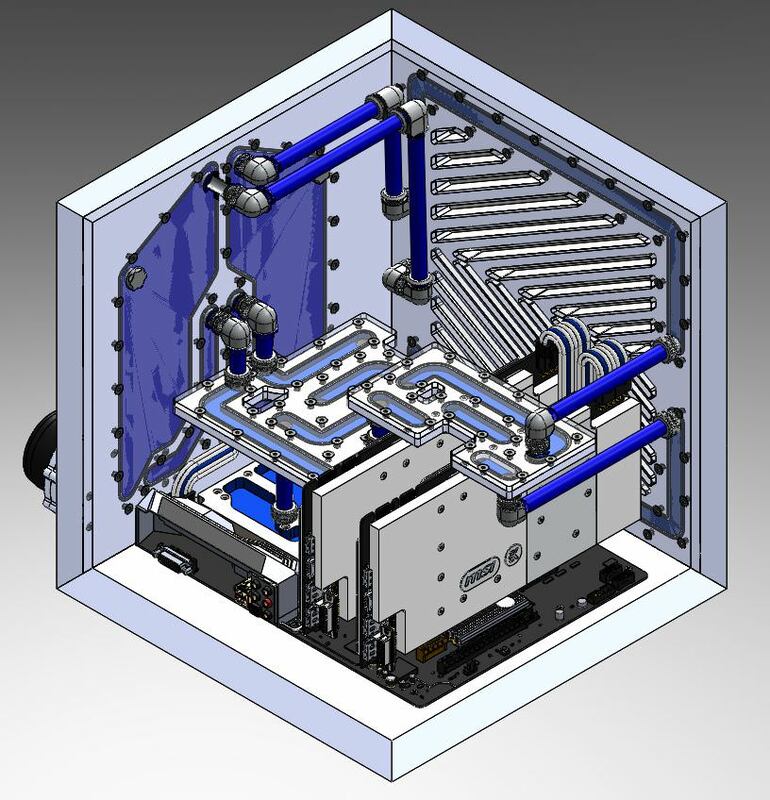 So I'm stuck with giving you screenshots of Solidworks. Next year, I promise! 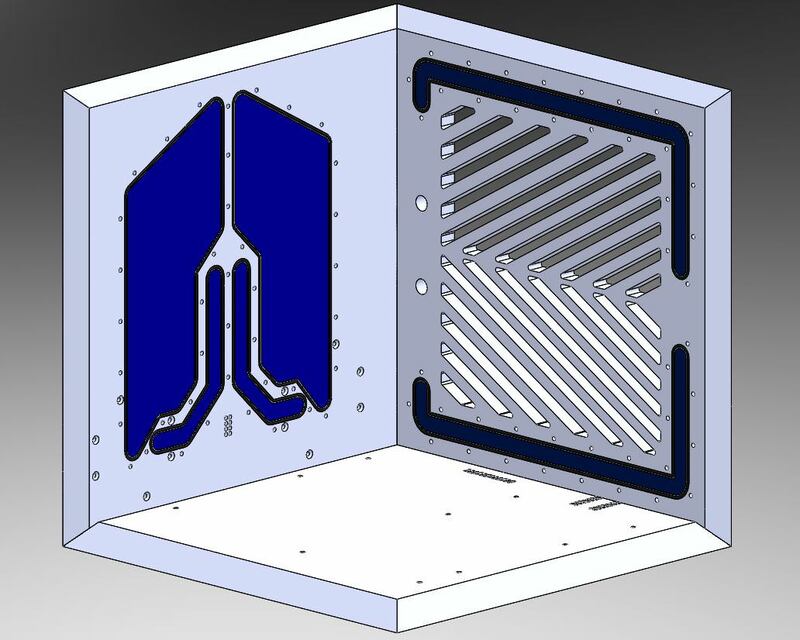 The right one will be the radiators' plate (2x280mm radiators). 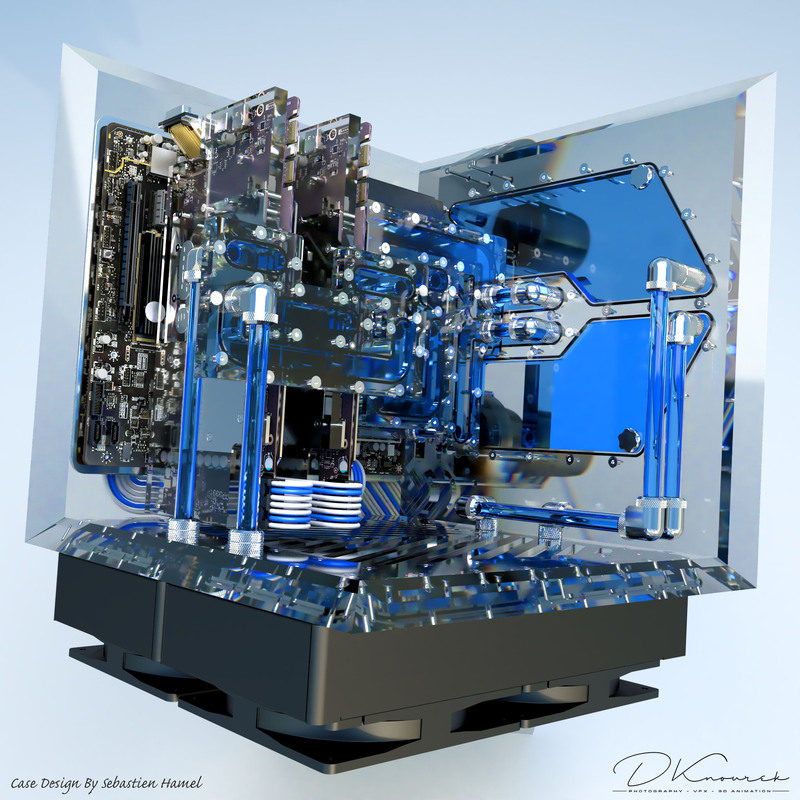 The idea of the acrylic plates is to reduce the amount of tubing inside the case, making its look cleaner. The liquid will flow thru the channels carved in the acrylic, sealed with a 2mm rubber o'ring and screws 40mm apart. 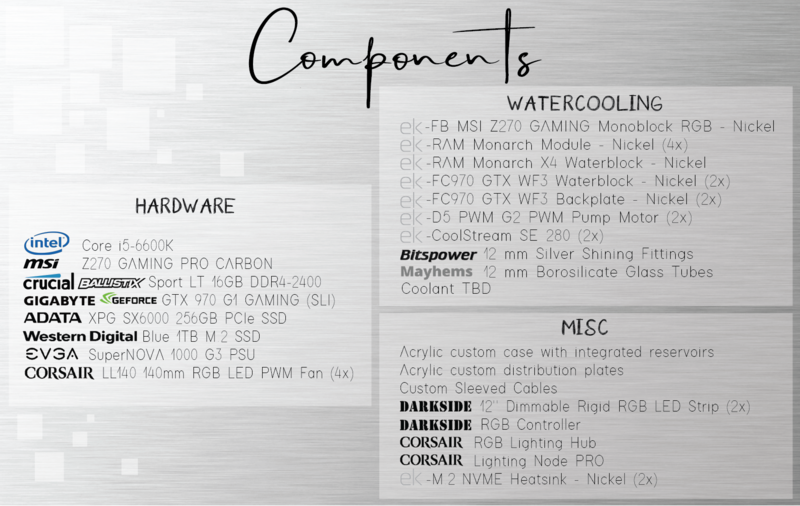 With the motherboard assembly, 2 GPU, the RAM and motherboard waterblocks. The dimensions of the acrylics plates are 14''x14''x3/4''. It will be kinda large, but I'm OK with it. 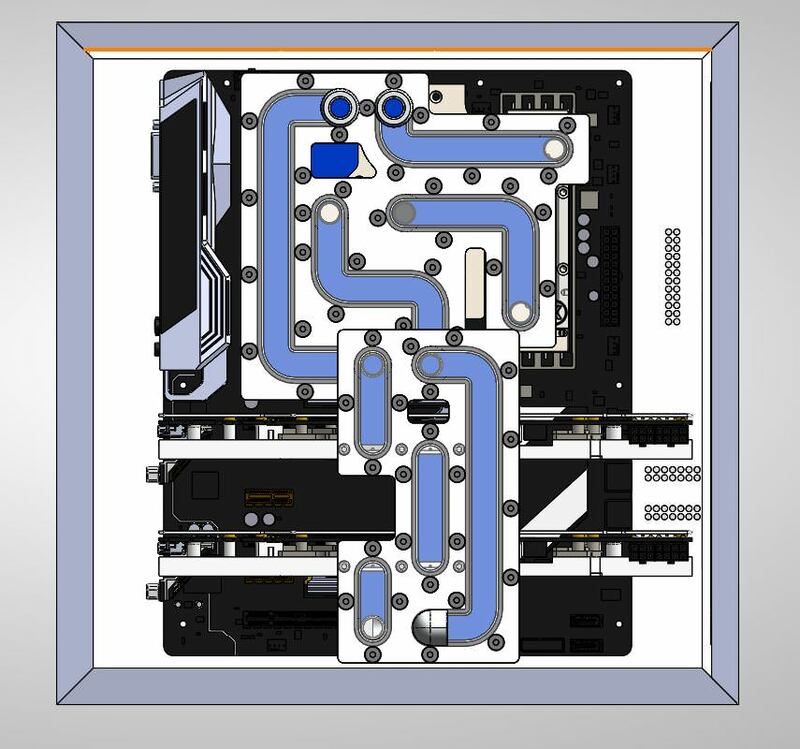 Here's the distribution plates between the reservoirs, the waterblocks and the radiator plate. 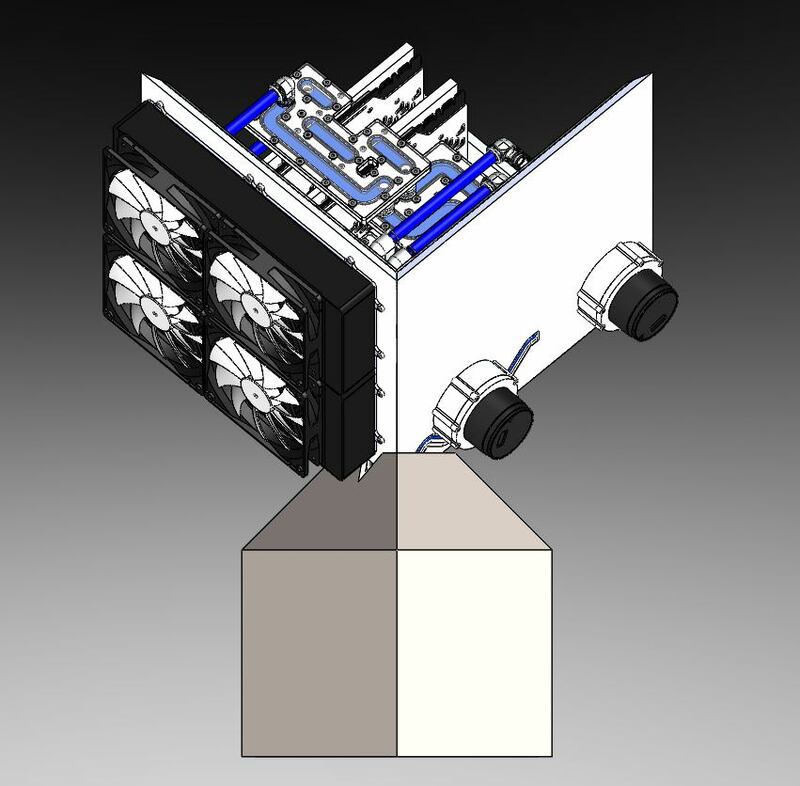 The left reservoir will be passively flow through the motherboard plate, then cool the GPUs. 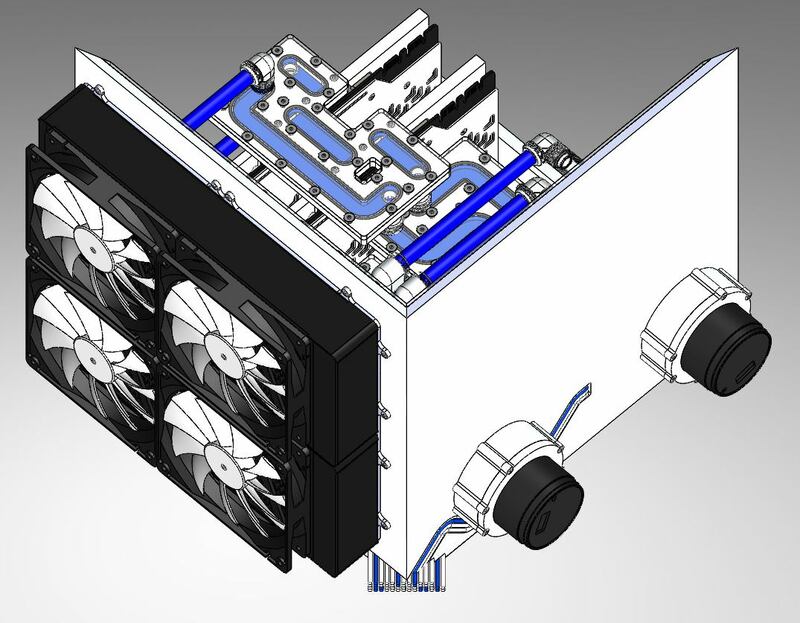 On the other hand, the right reservoir will cool the monoblock and the RAM, and then will passively flow through the GPU distribution plate. I will have 2 separate loop with that setup. The top view of the motherboard and the distribution plates. And you can see on the right side of the picture the 2 pumps and pump tops. And on that view, you can see where I will route the cables. I still need to figure out some details for the cables, but I hope it will look something like this. 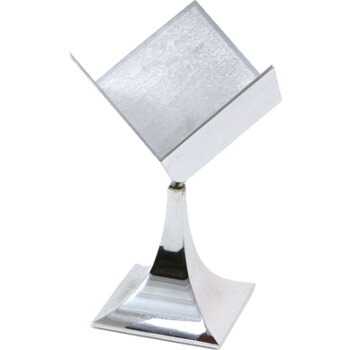 And finally, that core will sit on a triangular stand. I haven't work on it yet, so it's ugly for now. I will find a way to make it look good. The stand will hide the overflow of cables and the PSU. Probably made of brushed stainless steel. 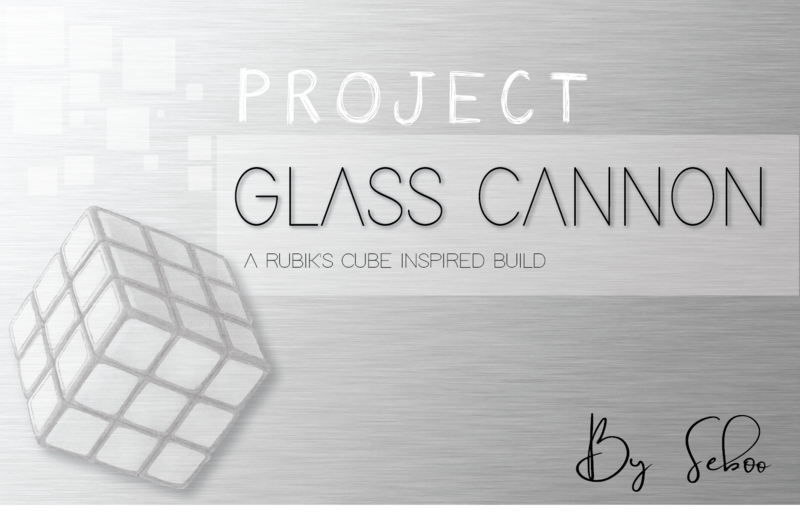 Many details will be covered later on, but there you have it boys, the Glass Cannon. Fragile, but mighty. Looking good man, can't wait to see some of the parts get created. What machine are you running these on? I don't have the exact information right now. 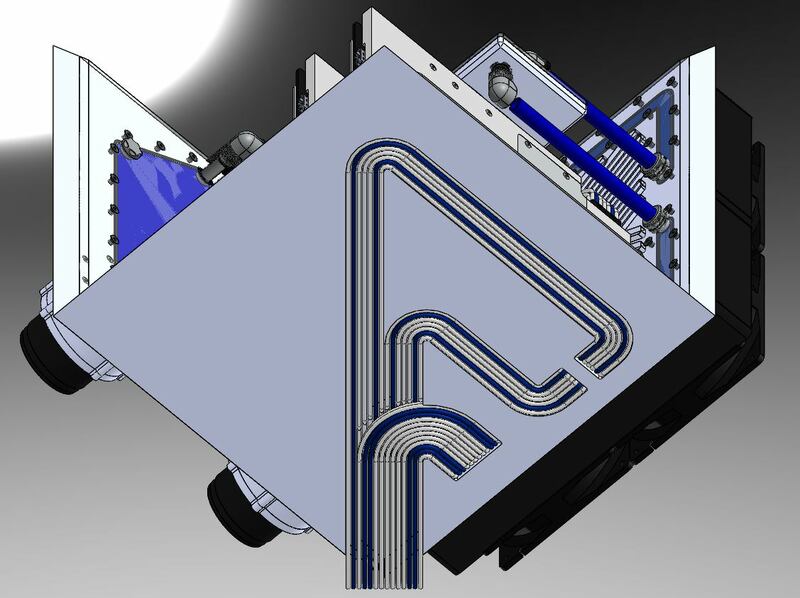 Actually, the machining will be done with the help of a contender from last year competition. He lives near me and was kind enough to offer me his time and equipment to make my project. I'll keep you posted with the machines used. The machining should start early October. Nice looking case. 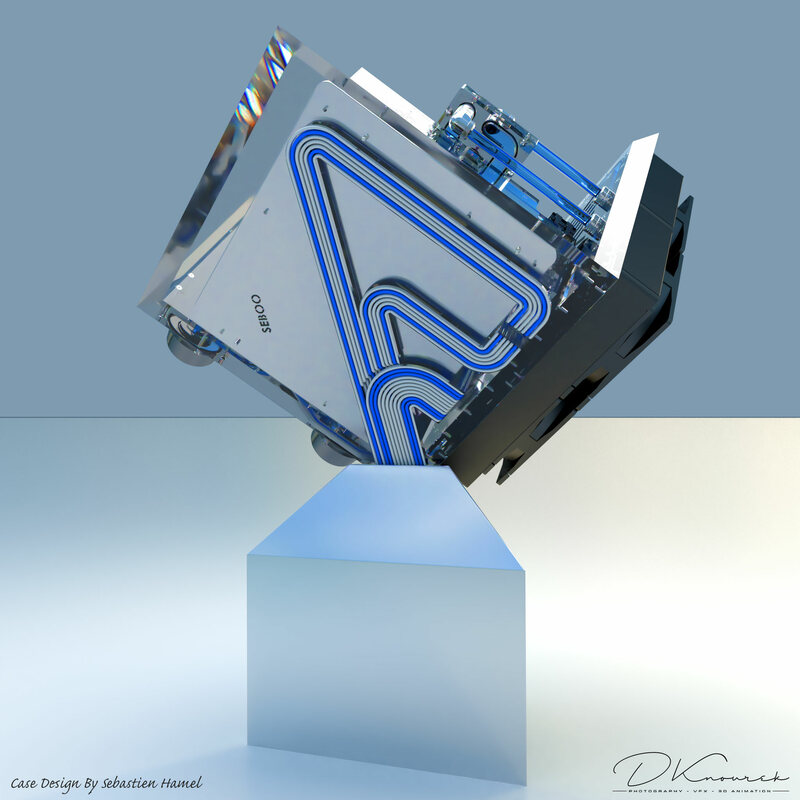 Someone combining ideas from Parvum, Singularity Computer Spectre and the Inwin Transforming Case. Had the same thought! Balls: this man has them. I may bite off more than I can chew with this project, but I want to give it a try. My mindset for a competition is go hard or go home! And even if I fail on some points, I know I'll learn a lot in the process and I'll be able to push the thing further on the next project. 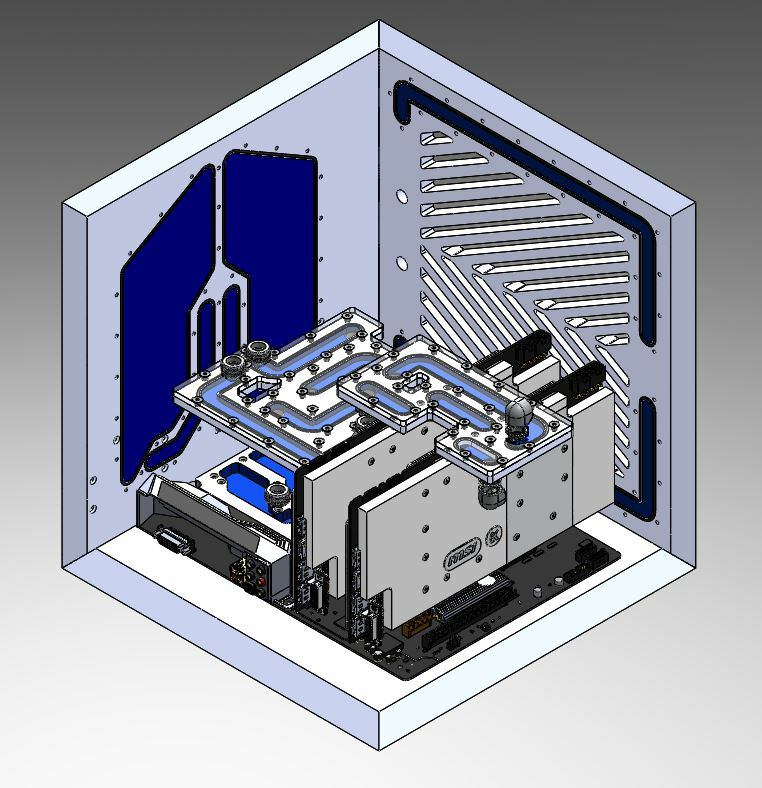 I know a lot about CAD, but not that much about CAM and machining stuff. It's going to be one hell of an adventure and I'll try to put as much information on the build log. The acrylic is comming home tomorrow, 4'x4' of 1/2'' and 1/4''. Then, the fun part will start! Stay tuned! Hey guys, time for an unexpected update. 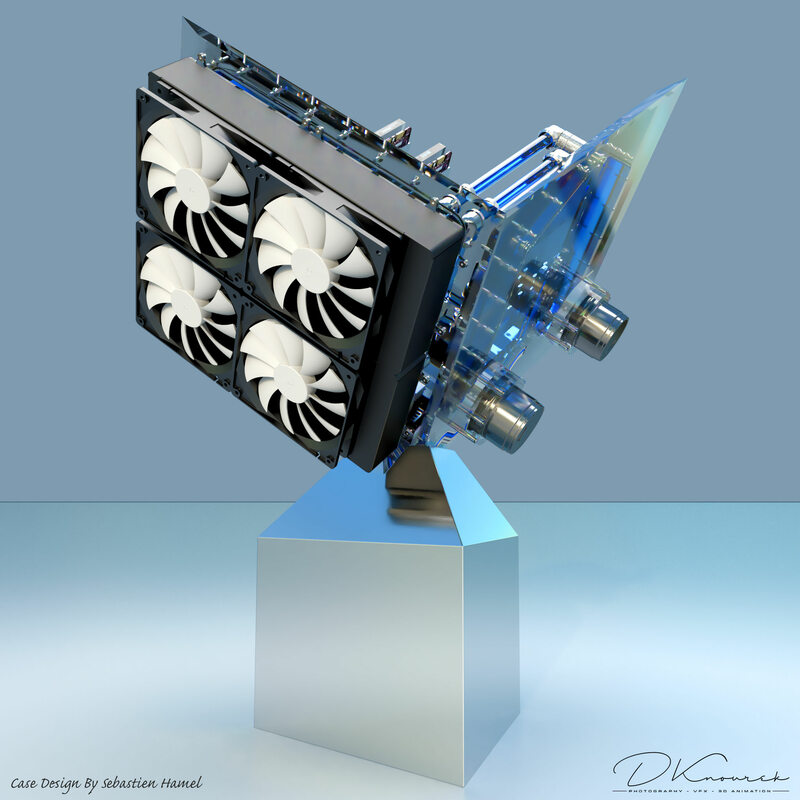 I said I didn't have enough experience to do renders of my case design, but one fellow artist on the forum wanted to give me a hand with the renders. He said he reached me out as he liked the design and thought it would be fun to render some images for me. Those images translate my design into reality, as I see it in my head. It gives a good preview of what the Glass Cannon will look like. Those 7 images are just icing on the cake for the preparation of the case, so give your eyes a treat. Special thanks to Dave Knourek (dknourek on the forum) for his help and time. This forum is full of good people. All times are GMT. This page was generated at 02:09 AM.